The death of a child is perhaps one of the most traumatic events a parent can experience. Losing a child may feel like an insurmountable life event for many, and the experience of grief is often complicated by feelings of regret or guilt as parents consider what they could have done differently to save their child—regardless of whether any other outcome was actually possible. The range of complex emotions associated with this loss are likely to affect parents for the rest of their lives. Navigating the life changes and grief accompanying the loss of a child is a process often made more difficult by feelings of isolation. Many parents find people in their lives have no idea how to react to their loss, and this can contribute to thoughts of isolation. Though family and friends may find it difficult to express their support, parents may find peer support groups to be helpful. Many therapists and counselors also specialize in helping people process the loss of a child, and there are a number of online communities offering support to parents who have lost an infant or child. Grief is experienced differently by every person, and no timeline can predict one’s experience of loss. Feelings of bereavement can occur throughout a person’s life, but it is important to remember there is life after loss. We have compiled a list of the 10 best online resources for infant and child loss support—excluding GoodTherapy.org—in 2015. Our selections are based on presentation, depth of content, and functionality. Share: This organization was founded in 1977 by hospital staff members who were urged to create a support group at St. John’s Hospital in Springfield, Illinois. Share’s mission is to serve those who have lost a baby during pregnancy, from stillbirth, or in the first few months of the infant’s life. They offer resources and personalized bereavement support and host a popular blog with related subject matter. Hope After Loss: Formerly the Hygeia Foundation, Hope After Loss was founded by Dr. Michael R. Berman in 1995. The organization’s original mission was to offer online support to women and families who experienced a pregnancy loss or neonatal death. It has since grown to include a community of more than 24,000 registered users and began offering in-person bereavement support in 2007. COPE Foundation: The COPE Foundation began as a group of families meeting in each other’s homes. It has since grown to a network of more than 700 families, who are dedicated to providing emotional support and healing to those grieving the loss of a child. Unspoken Grief: A site created to share information and offer support to those who have experienced miscarriage, stillbirth, and neonatal loss, Unspoken Grief also works to end stigma surrounding the impact of perinatal loss and grief. The site provides educational resources and peer-to-peer support through the anonymous sharing of feelings, inspirational quotes, and personal stories. Through the Heart: In early 2013, Through the Heart founders Karen and Sean Kelly lost their first child, 20 weeks into the pregnancy. They created Through the Heart out of compassion and with the desire to help others experiencing similar loss. The Comfort Kit program—one of the organization’s most visible programs—provides individuals or couples who have recently suffered pregnancy loss a kit containing personal care items, snacks, and a movie rental code. Miscarriage Association: The Miscarriage Association was created in 1982 by a group of people experiencing the pain of miscarriage. More than 30 years later, the association continues to provide support, information, and an online community to individuals, couples, and families affected by pregnancy loss. The Compassionate Friends: This website made our Best of 2012 list of websites for grief and loss, but we decided to include it on this year’s list because the organization specializes in providing grief support to families after the death of a child. Today, The Compassionate Friends has approximately 660 chapters in all 50 states, in addition to Puerto Rico and Guam. These chapters are dedicated to offering highly personal comfort, hope, and support to bereaved parents, siblings, and family members. Bereaved Parents of the USA: Bereaved Parents of the USA (BP/USA) is a national non-profit self-help group. Its many chapters around the country hold monthly support meetings, publish newsletters, and host an annual National Gathering where bereaved families can participate in workshops, sharing sessions, and hear guest speakers. BP/USA is free to join, and there are no paid salaries within the non-profit. MISSFoundation: According to MISSFoundation, more than 80% of the 120,000 child deaths each year in the United States occur before the child’s first birthday. This volunteer-based organization provides both crisis and long-term support to families after a child or baby’s death. They refer to their approach as C.A.R.E.—Counseling, Advocacy, Research, and Education. griefHaven: This online community was created by Susan Whitmore, who lost her only child in the early 2000s after she had been diagnosed with a rare sinus tumor. In the months following her loss, Whitmore started a website she hoped would become a grief haven for parents, siblings, family members, friends, and specialists, who could visit to find a collection of available resources. Today, visitors to her site can find support groups, support organizations, music and reading recommendations, and leave a message honoring someone’s life on the memory wall. 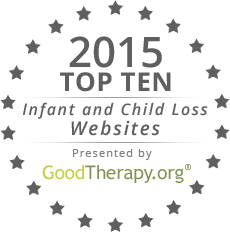 © Copyright 2015 by www.GoodTherapy.org Naperville Bureau – All Rights Reserved. Permission to publish granted to GoodTherapy.org. The preceding article was solely written by the author named above. The view and opinions expressed are not necessarily shared by GoodTherapy.org.